The kitchen faucet is one of the most used kitchen items. They need to be robust and durable as they’re used on average 20 times a day. If you’re an architect, then you will no doubt be consulting with your clients on such kitchen finishes. These touches make all the difference when it comes to kitchen design. The faucet should go well with the backdrop and sink in your kitchen. It should reflect your unique style. And, lastly, it should have all of the options and functions you would like it to have. 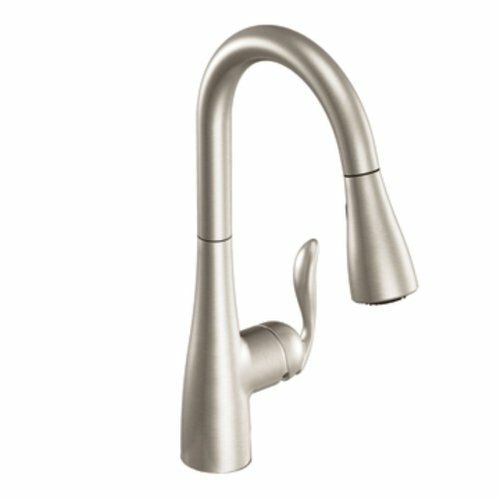 What are the hot and cold options on a modern faucet? Faucet water attachments come in two types: 1 hole and 3 hole attachments. If your sink is set up for 3 hole attachments and you want to use a single-hold faucet, you will need to get one that comes with a deck plate (also called a baseplate). Why is there a difference between the two? For a 3 hole faucet, the hot and cold controls activate a mixer behind the sink which changes the mix of hot and cold water pouring out. In a single hole faucet, the mixing occurs directly inside of the faucet itself. The plumbing for these two scenarios is slightly different but easy to figure out. 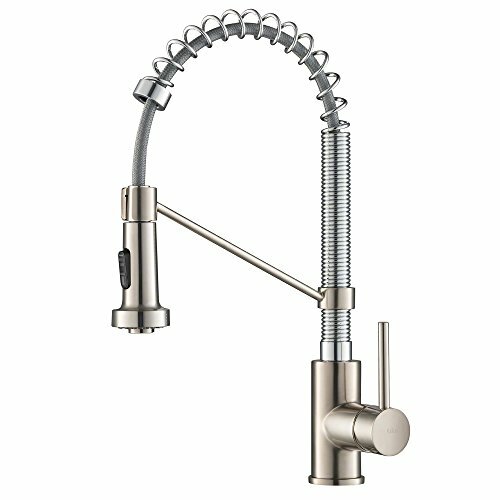 What types of materials go into modern faucets? Can I pick my favorite finish? All modern faucets are 100% lead-free. You never have to worry about that anymore. However, if you are moving into an old house, it is worth to not only replace the faucets and fixtures, but to also replace all of your plumbing, just in case. Have a highly-rated plumber check out all of your pipes to ensure that everything lead-based is replaced immediately. Finishes are the outward appearance of the faucet and they come in Stainless Steel, Chrome, Ceramic, Matte Black, Matte White, Brushed Nickel, Venetian Bronze, and Oil Rubbed Bronze. Occasionally, you can get a combination of two of these styles. I’m about to move/change my kitchen. What styles should I choose? You should choose whatever styles your heart desires. For clean, white kitchens, often white sinks or stainless steel sinks with Brushed Nickel or Chrome or Stainless Steel faucets are appropriate. For darker tiles, deeper woods, black sinks and stainless steel sinks, a Matte Black faucet or something in Oil Rubbed Bronze or Venetian Bronze will look especially attractive. Deck Plate (Baseplate) Included. This is always a must if you have a 3 hole sink and would like to be a single hole faucet. The deck plate covers up the other two holes and makes your entire setup look professional and clean. 360 Degree Swivel. Most faucets have some type of swivel function, but not all faucets have a full 360 degree swivel capability. This is great for times when you need to use the sprayer but move the head of the faucet around to the side or for when you want to pour a glass on your bar without walking around to the kitchen side. High Arch Faucet. 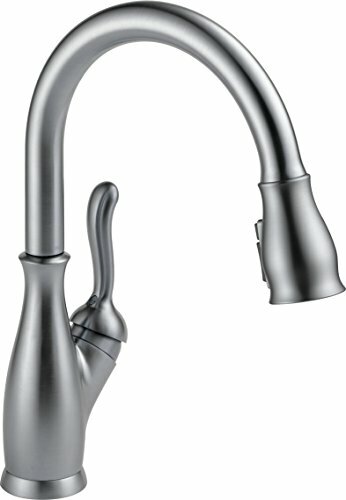 Many single-handle faucets also have a high arch in the neck, but not all of them do. This high arch prevents large mixing bowls and giant pots from being stuck under a flat neck of your faucet and barely getting it over the edge. You will definitely always want a high arch faucet. Pullout Sprayer. Many high arch faucets have pull out sprayers which detach from and come right out of the nose or head of the faucet. However, on flatter faucets, a sprayer may be included off to the side. Sprayers are also a separate function which can be requested on a custom job because they are incredibly easy to install. Large Handle (or handles). Handles which are tiny and close to the wall are great for tall adults, but short adults and kids may have a problem reaching everything when they are trying to go about their kitchen duties. Keep this in mind when choosing your faucet. Sensor Readings (3 options available). The first option is to have the sprayer on a sensor so that water begins pouring out from the moment you detach the pullout sprayer. The second option is to have a hand wave option where your hand moving in front of the sensor turns the regular faucet on. The third option is to have a touch sensor for your faucet so that only touching it will turn it on. Avoid all of these options when installing a faucet around small children. If the sink is clogged, they can flood the kitchen by accident. 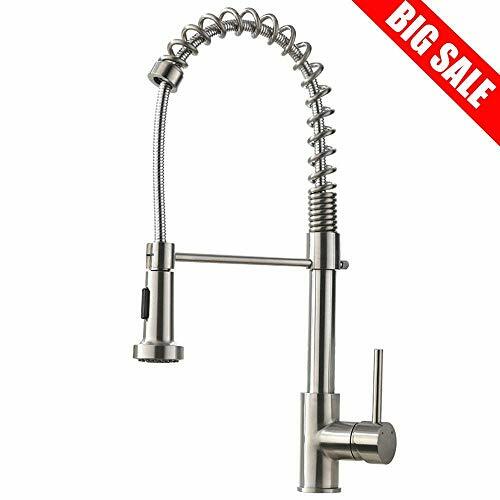 This nickel-plated faucet has a high arc in the structure which helps it to be used for washing vegetables, loading bins into the sink and provides a lot more room in the kitchen sink for washing dishes. It has a single handle which is easy to leverage (but is small, so kids may have trouble reading it) and the head of the faucet can be removed to create a pullout sprayer and then it can be reattached. This incredibly stylish (and 100% lead-free) oil-rubbed bronzed faucet combines both beauty and function together in one perfect unit. This single unit has a single handle to adjust both flow and hot/cold mixing. The arch in the faucet allows it to give you lots of room and space over your kitchen sink and it rotates all of the way around in order to use it or put it out of your way whenever you need to. It also has a pullout sprayer attached to the tip of the faucet nose. The kooky design of this high-arch commercial faucet with dual outlets is very special and interesting. 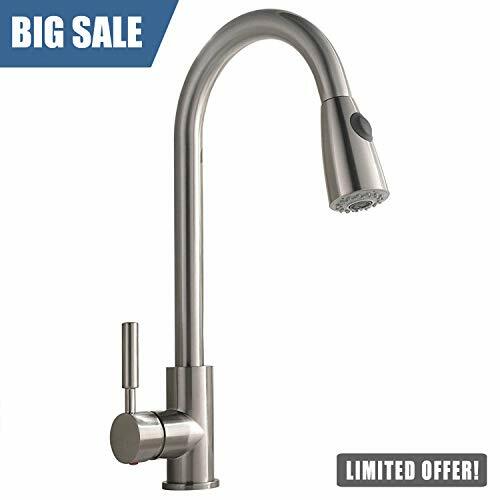 It comes with a pullout spray hose, a really interesting rotating assembly, and the two outlet attachments give you a lot of control over what you use this faucet for. You can have high-powered, wide-spray function and even, clean, straight flow. The minimalist design of this sleek, stainless steel faucet is pure Scandinavian perfection. The single handle is a little larger than other high-arch faucets which have a single lever, which means that kids will be able to use it a little easier. It also has an easy-to-clean nozzle on the faucet head and it is super easy to install. The design allow for massive control over the flow of water and the sleek simplicity of it is quiet and smooth in rotation. This attractive, curvy faucet has a pullout spray head which has magnetic attachment. This allows kids to help out with the dishes by using the spray head more easily. Without having to screw and unscrew the head, kids can pull out the spray head and use it for better dishwashing and reattach it magnetically. This faucet comes in a wide variety of finishes, from brushed nickel (a softer feel) to bright, shiny chrome. The Venetian bronze finish is even more attractive than the stainless steel finish. The Venetian bronze finish also goes well with cherry wood kitchens and warm red tones in granite countertops. This is the kind of high-tech faucet that makes life much easier on dishwashers and cooks alike. The high-arch design facilitates loading big pots and bins in and out of the kitchen sink. 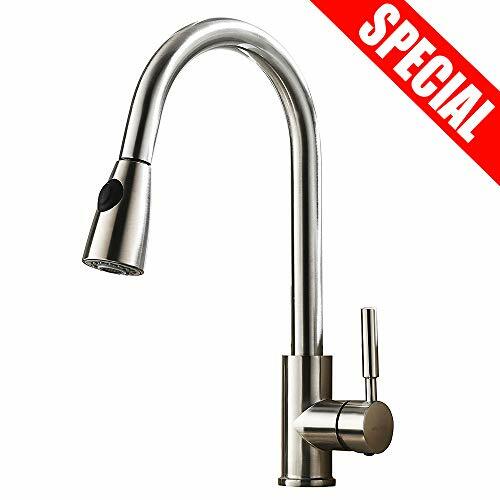 It comes with a lever or handle to conrol the mixture of hot and cold and to turn the water on and off when simply using the faucet like normal. What really makes this particular fauce so special is the pullout spray head. By simply detaching the spray head from the faucet, the sensor turns the water on automatically. This is a great way to hold the dish and spray without needing a third hand to turn the water on and off. Option #2 of this unit allows you to ALSO use a sensor for regular faucet use. Simple wave your hand in front of the sensor and the water turns on. This is only available in the Dual-Sensor option when choosing which unit to purchase. The block-cylinder design of this ultra-modern, luxury faucet makes it look and feel particularly attractive and particularly Scandinavian in design. The outlet allow for steady flow of water and also a high-powered spray. It does not have a baseplate, which means that it only goes on single-hole water attachments. There is a lifetime replacement parts warranty on this particular faucet which allows you to use it and have it for as long as you want. Just be sure and store the warranty somple place safe. The brushed steel finish is a lot shinier and more reflective than the brushed nickel finish. This solid, wide, flowing faucet is both block and curvy in design, which gives it a nice, solid feel when looking at it, using it as part of your kitchen design, and applying it. The large handle is fully adjustable and is nice and large and easy to grip. 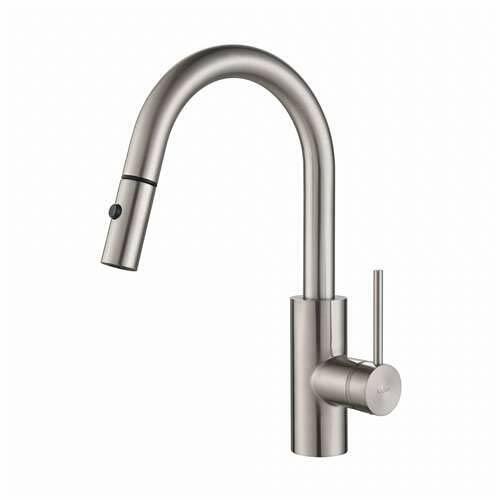 This faucet comes in Chrome finish, Matte Black finish, and Oil Rubbed Bronze finish. For a slightly higher price, you can get the exclusive Spot Resist Stainless Steel finish which looks particularly nice nice to a nice dark backdrop. The Oil Rubbed Bronze finish looks elegant in dark tiled kitchens next to a nice white or cream sink. The signature Kraus coiled spring look and feel of this elegant faucet is further accentuated by the range of finish options available. You can get your unique Kraus design in Chrome, Stainless Steel, Matte Black. If you want additional customization, you can also get these units in combinations of Chrome and Stainless Steel and in combinations of Chrome and Matte Black. The sheer variety allows for some pretty interesting kitchen units. The typical Kraus high-quality is shown in the continued rave reviews of this particular faucet. No problems were detected by users and the stylish design, hosing, and plumbing of this unit are unmistakably secure and tight. This is possibly the slenderest and sleekest of all of the high-end faucet designs available on the market today. 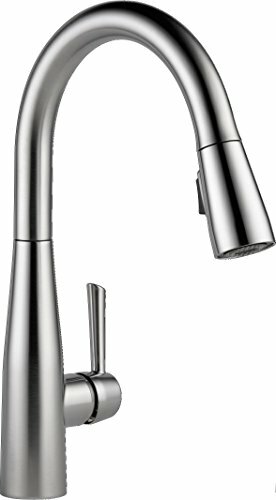 This faucet comes in both Standard and Touch2O design. The Touch2O option allows you to touch it on and off through a touch sensor in the faucet. Getting Touch2O will cost you about $75 more than the Standard version. Both are great options. The large handle on a sliding scale mixer allows you to exactly control the flow and hot/cold mix as much as you want. 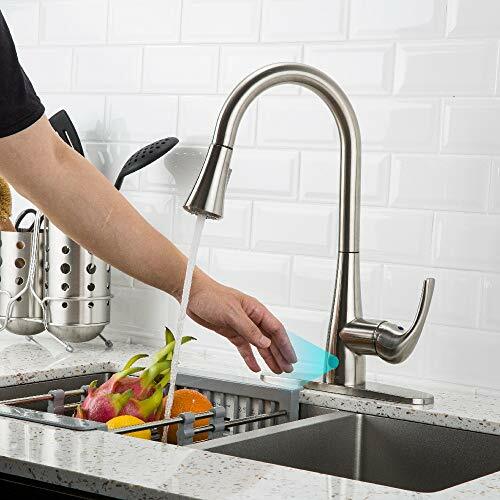 The pullout sprayer is also convenient for washing dishes and vegetables and for filling large bins over the side of the sink. 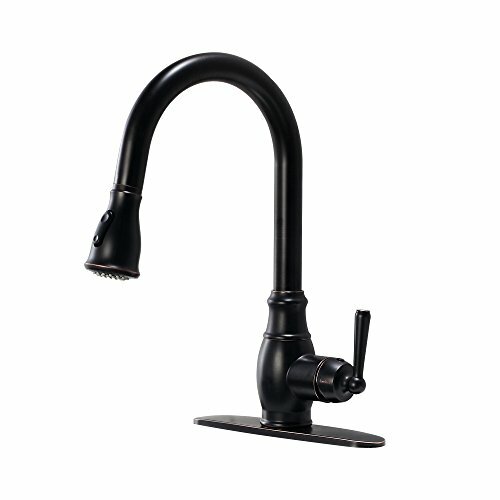 Recommended: The Matte Black finish looks particularly attractive with this specific faucet. All of these faucets come with big guarantees and lots of user reviews to help you in further guiding your decision. In conclusion, your kitchen sink faucet is a highly functional part of your daily lifestyle. It should reflect both your style and the functionality you require from your life experiences. Happy Shopping and Enjoy Your New Faucet!